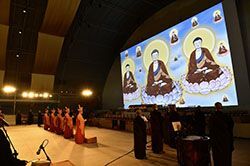 Taiwan-based Buddhist organization Dharma Drum Mountain (DDM) recently held the second Global Followers Assembly and the annual Great Compassion Water and Land Dharma Service. ETC’s Taiwanese dealer, Ming Li Engineering & Consultant Co., LTD., provided ColorSource and Source Four LED Series 2 luminaires and an Eos-family control system to light up the two recent events. Source Four LED Series in use at the Global Followers AssemblyBoth the Global Assembly and the Dharma Service were held at the DDM World Center for Buddhist Education in Taiwan. Approximately 10,000 followers attended the 2015 Global Assembly. Following the Global Assembly the participants were invited to attend the Dharma Service – “an opportunity for followers to reverse bad fortune, worship gods, do charity and be liberated from suffering,” according to event organizers. Anthony Wu, who has been the events’ lighting designer since 2007, used an ETC LED lighting system for the events. To create a solemn atmosphere Vu installed 72 ColorSource PAR LED fixtures for house lighting. The luminaires were balanced properly for color, uniformity and intensity to work smoothly with the stage lighting and brighten the 51,021-square-foot area. Eight Source Four LED Series 2 Daylight HD and Tungsten HD luminaries projected a gobo of Gandhanra, the god of music and fragrance, using four cue loops of color-temperature fades. Two Source Four spotlights were also used to illuminate a Western Trinity image on the stage backdrop. “The profiles light the three Buddhas, creating a 3-D visual effect for the audience,” said Wu.